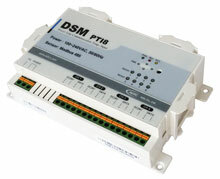 DSM PTI8 is a device to deliver through power line communication the temperature measured by ATS-DS duct temperature sensor that is connected through 485 MODBUS. It connects up to 8 ATS-DS sensors. DSM PTI8 measures the supply temperature and return temperature of DX/Package Unit.